In part 1, I talked about 4K and 8K production but in this part, let’s focus on VR, 5G ATSC 3.0 and more. While VR content was pioneered at the Rio 2016 games, supporters say it is improved in 2018 especially due to the corporate support of Intel, which is working in collaboration with Olympic Broadcasting Services (OBS), NBC Sports and Eurosport. Live and on-demand VR content for 30 events was being delivered to viewers using Oculus Rift, Google Daydream, Windows Mixed Reality and Samsung Gear VR headsets. Intel’s True VR rig contained 12 cameras in a 180º configuration with some rigs capturing in 4K resolution. For each event, at least three 4K stereoscopic pods were strategically placed throughout the venue. In Rio, VR content was captured in 360º format, but Intel chose 180º because most of the action is in that sphere and it allows for a higher quality image with less latency, especially when captured in 4K stereoscopic. With the live experience, viewers were able to choose their own camera angles or select to view a “VRCast,” a version of the show cut by a VR director with inserted graphics and (sometimes) audio commentary. In addition, 2-3 on-demand VR pieces were posted each day, mostly in a 360º format. These are more experiential, for example, from rigs on the top of a skier’s helmet, and appear to be more popular. Intel also built a number of tools for OBS that includes an SDK to help integrate the VR streams into rights holders’ new or existing VR apps. The use of VR for sports viewing is still in its infancy, but OBS wants to remain on the cutting edge. While, accessing the VR content was simple on the GearVR after downloading the NBC Sports app (but you need to have a cable/satellite provider that offers the coverage), not everyone liked the recent VR experience. For example, according to one Engadget story, the app was very “glitchy.” Plus, some events were just not good choice for VR such as downhill, giant slalom, ski jumping, halfpipe, bobsled and luge where the athletes fly by so fast it is just a blur. Skating was not much better as the cameras showed wide shots where the resolution was too low. Slower paced and more intimate events like curling fared much better. VR can still deliver some great ambience, but the technology is still an impediment, not an advantage, it seems. 5G is designed to be at least 10 times as fast as today’s 4G Long Term Evolution (LTE) network, promising download speeds of up to 20 gigabytes per second and a response time of less than 0.001 seconds. The Olympics were a showcase for some of the possibilities of what 5G cellular communications networks will offer. 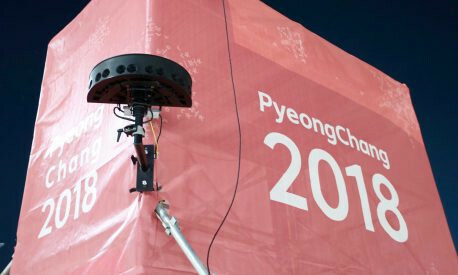 For example, Intel and Korean Telecom (KT) partnered to set up 5G stations to track cross-country skiers and deployed cameras inside an ice arena and the Olympic Sliding Center. These set ups were essentially 5G modems used to uplink video with very low latency to the IBC. KT is using the 5G network to showcase four technologies: sync view, time slice, 360º VR and omni view. 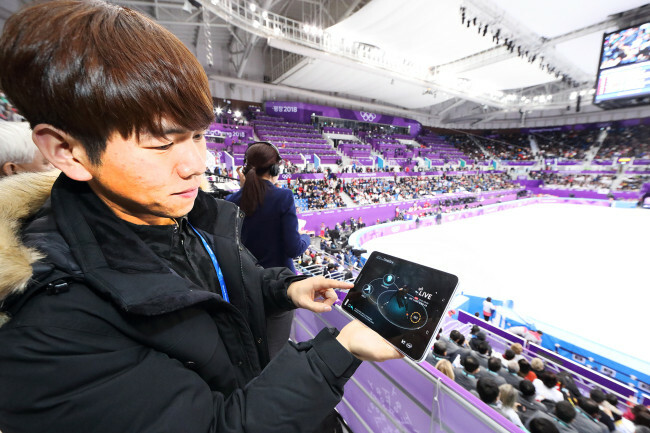 Time slice was first introduced to visitors at KT’s 5G exhibition space and Olympic stadiums in PyeongChang and the Ice Arena in Gangneung. It is a 5G-dependent video streaming technology that lets viewers control the time, target and angle of what they are viewing. For instance, while watching a figure skater perform a jump, viewers can stop the screen to see that particular moment from different angles. KT has installed 100 cameras at Gangeung Ice Arena for the time slice service. Sync view was used for the bobsled games. KT attached tiny cameras on a total of 107 bobsleds in order to transmit live, real-time footage from the athletes’ point of view as they sped down the track at high speeds. I saw some of this footage and it was eye opening to see the track unfold in front of you at 90 miles per hour! Omni point view was introduced during the biathlon race. It is a live broadcast service that hosts multiple live-feed videos at once. Viewers can choose the broadcast angle they want to view from, including personalized views of each athlete through GPS sensors attached onto their clothes and 5G module-adopted cameras. It is also being applied to cross-country skiing. KT’s Omniview service enables a live broadcast service that hosts multiple live-feed videos at once, allowing viewers to follow a specific athlete through precise GPS sensors attached to their clothes and 5G module cameras. In addition, 360º VR was showcased during the ice hockey and snowboarding tournaments. This let viewers watch the game live in VR by strapping on a 5G-connected VR headset. Content could also be viewed using 5G capable tablets at certain “spectator zones.” That’s because the 5G signal that Intel and KT set up covers a pretty limited area of roughly half a square mile. At the Opening Ceremonies, athletes carried in 1200 LED candles that then lit up in the form of a dove. These were all connected via a 5G network set up by KT and controlled with a single tablet. The lights were synchronized with the music – something that was possible because of the very low latency. The Korean carrier also operated “5G buses” featuring various 5G technologies as a promotional ride available to selected guests. “We are showcasing the world’s first ‘5G Olympics,’ running the first large-scale 5G network system in PyeongChang two years before the expected timeline,” said KT Chairman Hwang Chang-gyu during a joint ceremony on Jan. 31 at the company’s 5G promotion space in Gangneung. After showcasing the pilot services based on non-standard 5G network, KT aims to move forward commercializing the network based on its PyeongChang specifications as early as the first half of 2019. Korea TV began broadcasting in ATSC 3.0 in 2017 and LG has also been selling TV sets with ATSC 3.0 chips in South Korea for perhaps six months as well. However, this is the first Olympics that has been broadcast in the format. To highlight its capabilities, ETRI (The Electronics and Telecommunications Research Institute) provided ATSC 3.0 receivers onboard a shuttle bus that carried international media throughout the coastal Olympic region. The ATSC 3.0 signal delivered 4K video with immersive sound and can add interactive features to involve viewers in the broadcast. The capabilities of the ATSC 3.0 bus allowed writers and reporters to keep up with the games as they travel ledfrom location to location. In addition, U.S.-based WRAL-TV had two news crews at the Games and they participated in the bus demo. The Raleigh, N.C.-based station, which began broadcasting ATSC 3.0 in 2016, also facilitated a demo in the U.S built around NBC’s coverage of the Winter Games. The NAB, NBC Universal, Samsung and LG/Zenith are also participating in the event, which took place on Feb. 19 in Raleigh. Intel set a world record at the 2018 Winter Olympics with their Shooting Stars drone demo. While the drone flight was pre-recorded, it was broadcast as part of the opening Ceremonies. 1,218 drones were flown in synchronization eclipsing its previous demo record of 500 drones. 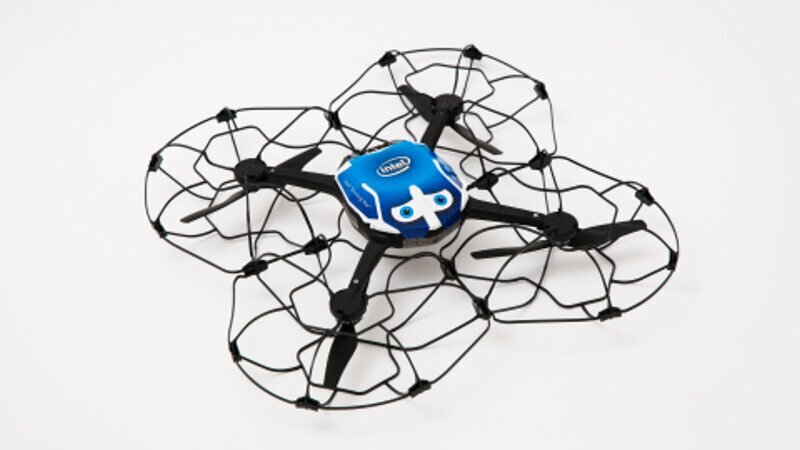 Each drone weighs 330 grams, has a 6” (15cm) rotor and built in LED lights that can show 4 billion color combinations. A single pilot controls the formation. 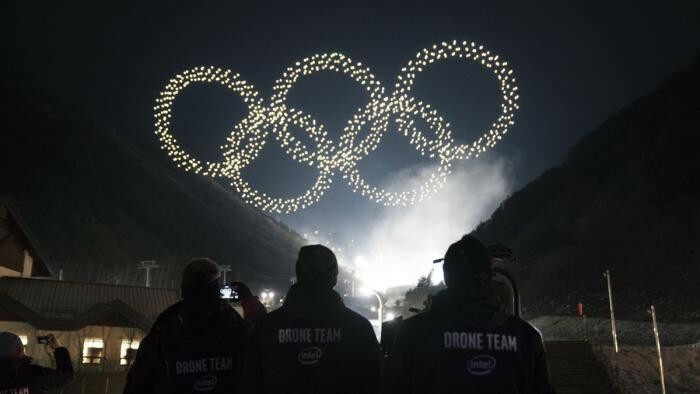 Perhaps the most memorable image was the drone forming the Olympic rings over the downhill ski slope. There were many other firsts from these Olympics, but I think I have summarized the main items of interest. Can Electronic Viewfinders Match Optical Versions?